PermaBilt® is the premier post frame builder in Western Washington having built over 20,000 plus buildings since 1973. And each building is different, customized to the needs of the customer. 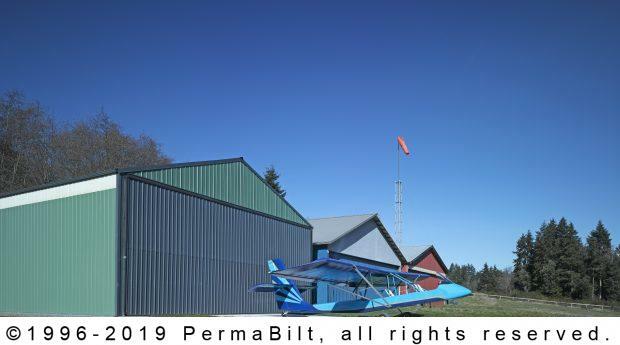 So when a Vashon Island Washington customer wanted to build a hangar for his experimental aircraft – an Air Cam w/Rotor 100 engine designed by Phil Lockwood - he knew we had the expertise. The most unique aspect of his hangar was installing his Schweiss bi-fold doors. These doors use heavy ¼” aircraft galvanized steel type lifting cables. All cables are sized and the lifting drums are sufficient to give the 5:1 safety factor. The gear motor is equipped with an electric brake to guarantee to stop and hold the door in any position of door travel. And, the electric operation is pre-wired and fully assembled. The motor, gear box and all necessary hardware are included with the garage door. All drive bearings came standard with grease fittings and heavy duty components ensuring many years of use. We built the building and installed the door and the customer had an electrician do the wiring to make the door operational. Whether for business or pleasure, PermaBilt® understands the importance of protecting aircraft from the elements. 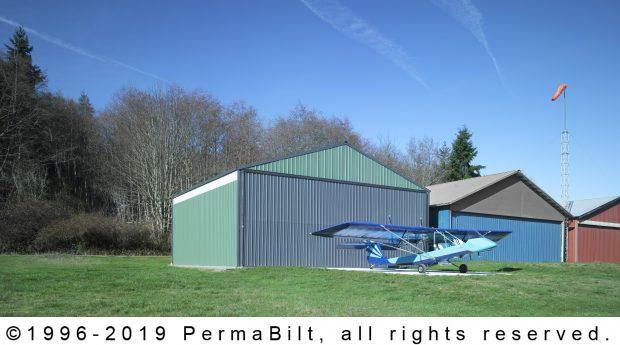 From financing and permitting, all the way to the end product, everyone on the PermaBilt® team was dedicated to providing our customer a stress-free experience resulting in a commercial airplane hangar he’ll be proud to own for years to come. "I wanted to add a very hearty thank you to your crew on the construction of my pole barn. They were very professional and timely in their efforts."